As a parent with a small child no doubt you are always on the lookout for new fun and easy ways to teach your toddler how to learn to spell, and there are many educational moble apps out there that help in this area, and a new fun educational app for the iOS platform has now been released called My First Spelling HD. 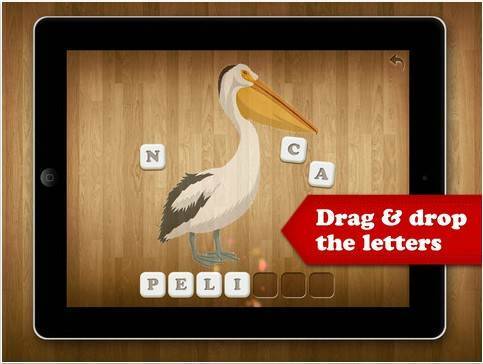 The My First Spelling HD app is of course for the Apple iPad and is an interactive spelling game that is side to develop fluency by way of dragging and dropping letters to make a word that helps your child to read and spell. The My First Spelling HD iOS app features 80 words, which will be updated free with 60 new words that are in development, 3 levels of difficulty — 1 to 4 letters — 5 to 7 letters and 8 to 12 letters, lifelike pronunciation in mother or children’s voice, musical instrument and animal sounds. The app also features a choice of letter modes such as handwriting, block capitals, and lower case, high quality original drawings and the ability to introduce your child to a second or third language, English, German, French and Portuguese. For those parents that may be interested in the My First Spelling HD app we have a quick demonstration video for your viewing consideration below, so head on down and mash that play button to see if the app is for you. If you decide you would like to take advantage of the learning ability of the app you can download My First Spelling HD to your Apple iPad at a cost of $1.99 by hitting up iTunes.